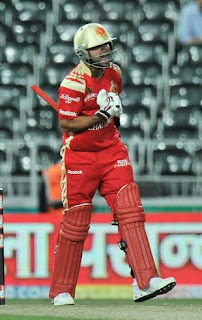 In a nail biting finish slated as the first Quarter Finals, Royal Challengers 160 for 4 in 19 overs, beat Lions SA 159 for 6 by six wickets. Vandiar and Petersen , gave Lions an explosive start scoring 29 in three overs. Vandiar and Cameron fell in successive balls at 29, of Vinay Kumar, snapped behind the wicket by Uthappa.Petersen 45 of 29, Jarsveld 24 of 18, McKenzie 39 of 35, and Frylinck 22 of 9, built up the Lions's innings to finish at 159 for 6. On a smallish ground and a good batting wicket, Lions were probably short of 25 runs. Vinay Kumar 2 for 23 bowled well, supported by Steyn and D du Preez, in spells. But the bowler of the day was the wily veteran Anil Kumble, who held all the batsmen under a tight leash, and finished with a test match figure of 4.0.13.1. Royal Challengers, handicapped by the non availability of injured Kallis, opened with Dravid and Pandey. The pair gave a brisk of 53 in 8 overs, when Dravid fell for 33 of 26. Kohli joined Pandey and the pair played sensibly before Pandey fell for 44 of 36 in the 13th over with the team score of 85. Kohli got in to a rut at this stage and departure of Taylor did not help the cause either. Uthappa was run out for 7, thanks to the poor call of Kohli with team score reading 112 at 15. With 47 to get in 5, O'Reilly was taken to the cleaners in the 17th by Kohli scoring 18 runs in the over. Royal Challengers got through in the 19th over, and took the second spot in group, for a place in the semi finals. Cameron, Deacon and Phangiso picked a wicket each. The loss put the Lions out of contention. Redbacks and Royal Challengers will play the semifinals slated for 24th and 25th.